I fly a lot and it was mostly international routes in the early years. These past few years, I found myself fly a shitload of QQland domestic flights instead. It has gotten so bad that if I arrive at my destination within a hour of the scheduled time, I give myself a pat on the back and consider the flight to be punctual. What makes matter worse, is that the reason for the delay will never be made known to you. It's like talking to the wall when you ask about your flight that exists only in theory at that time. I get mixed feelings whenever I read news of ground crew getting beaten up by frustrated passengers or irate passengers refusing to get off the plane. While I feel sorry for these guys who get abused (worse, if violently abused), I can never be very sure coz you should see the kind of guailan attitude these airline folks put up and you wondered if they deserved it. So anyway, with smartphones, we have smart apps that solve this problem where I can tell the crew to take their "due to technical reason" info and shove it up their chrysanthemum. This is my favourite. In the past, it caters only to QQland domestic flights but in recent months they have expanded beyond their borders to include international flights as well. Current weather at both origin and destination. Current airport runway traffic report (both departures and arrivals at both origin and destination), which gives you a clue if you are going to be stuck on the tarmac queuing to take up or land. Details for the aircraft's previous sector i.e. if the plane is coming to your airport late, you'd be sure to have a delayed departure as well. Likewise, if your aircraft arrived on time, it is very likely that you are going to have a punctual departure as well. For the flight enthusiasts, they have details on what type of aircraft e.g. B738 or A320 etc and its age i.e. how many years that particular aircraft has been in service. More importantly, is that the software pushes notification to you to update on its status ranging from what check-in counter, to what boarding gate, to time of boarding, if on schedule or otherwise, to what baggage claim belt as well as any last minute changes to the flight timings. The downside of this software is that while it professes to push notification of changes, it recently more often than not, doesn't really deliver what it promises to do. The result is that you find yourself constantly checking you phone to see if there is any new updates. The other downside is there are times where it can't locate the international flight that you wish to track. One especially if it is some obscure budget airline. 飞常准 and 航班管家 came out around the same time. While 航班管家 has the better, more user-friendly interface, was a tad too simplistic for my liking. Hence, I found myself using both software to back up each other. 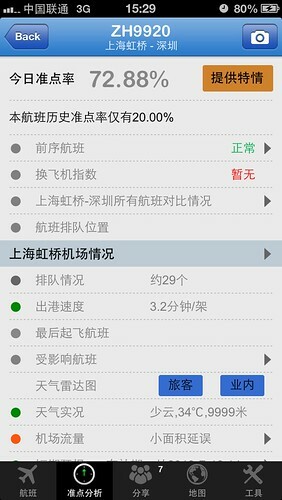 航班管家 has the fastest update but only if it is in the mood to do its job. On a good day, updates are pushed to your phone within minutes of the actual event e.g. plane touching down or new gate information or commencement of boarding. 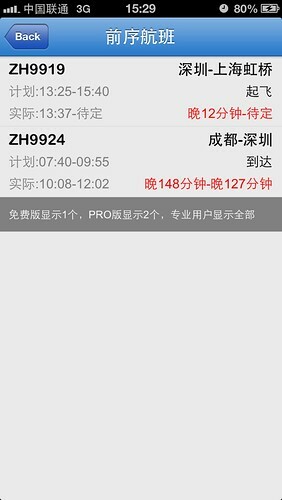 飞常准 has one more useful feature and that is the calculation of the flight's punctuality probability that day. (See image below) to give you an idea to better manage your time be it as a passenger or to pick/send somebody. Let me give you a scenario. You are slated to pick up someone from the airport. So you key in the person's flight ahead to monitor that flight. OK, your phone chimed notifying you of the flight's delay. From there you are able to calculate the new time of arrival (which I will teach how in the final segment of this trilogy) and plan your trip to the airport accordingly. That way, you avoid getting to the airport too early when you can better use that time for something else. As far as 航班管家 is concerned, they are adding more and more features and looking at how the development of this software is progressing, 飞常准 may ended up being redundant. Fortunately for 飞常准, the quality of notification of 航班管家 is deteriorating which means 飞常准 lives to see another day. This is the ang moh version of the other two software and I am guessing that this is an US-based software which probably mean that its forte is monitor US domestic flights which is not really relevant for me at this time. What the other two software lacked, i.e. international flight tracking, FlightTrack fill that gap nicely. However, this advantage is slowly being ebbed away as the other two Chinese software are improving by leaps and bounds with their international flight database. Amongst the 3 software, FlightTrack is the most fervent notification pusher which I like very much. Problem, and fatal if I may add, is that the updates are very dated which in this day and age of Now! Now! Now!, means that this could be the deal breaker. Look at the screen cap below to allow me to illustrate this point. Look at the time at the top of the image. This image was capture at 18:01. Now look at the latest FlightTrack notification. The one that says "now". 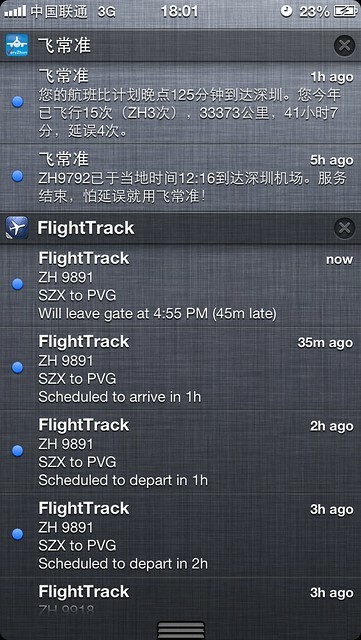 At 18:01, FlightTrack send me a notification that ZH9891 will leave gate i.e. depart at 16:55. That is more than 1 hour later! Harlow! The plane is halfway in the air already then you tell me it is about to depart? In the next entry, we will see how these three software square up against each other.